Specifically designed for the SIG Sauer® classic P-Series DA/SA pistols (not DAO/DAK). The Enhanced Daily Carry (EDC) with Straight Optimized Trigger (SOT) reduces DA and SA pull weights with dramatically improved pull characteristics. This system consists of our new SOT mated to a enhanced, custom-designed trigger bar. Ensure you read the detailed description below to order the correct version. Specifically designed for SIG Sauer classic P-Series DA/SA pistols (not DAO/DAK). 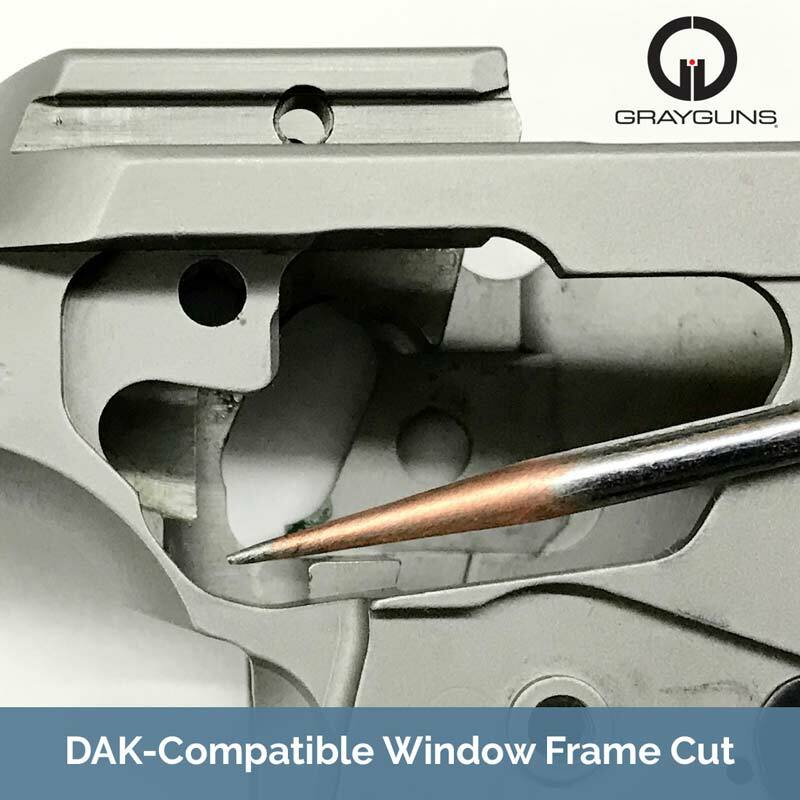 The Enhanced Daily Carry (EDC) with Straight Optimized Trigger (SOT) is the next innovation from Grayguns. The trigger kit reduces double action and single action pull weights with dramatically improved pull characteristics. This system consists of our SOT mated to a enhanced, custom-designed trigger bar. In addition, multiple drop-in options will be available to tune your action for your specific requirements. The SOT face contour provides unequaled double-action feel and optimal 90-degree single action break angle with desirable straight-face control. 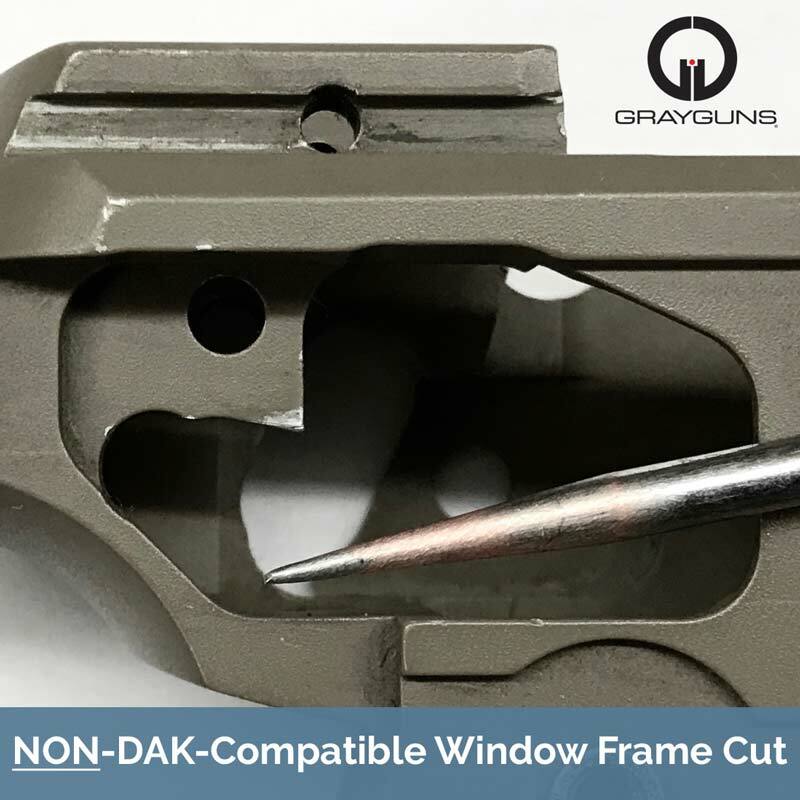 Grayguns proprietary enhanced leverage geometry reduces pull weight approximately 25 percent without compromising reliability or factory safety values. The SOT is dual-adjustable for pre and over-travel, the Grayguns standard. 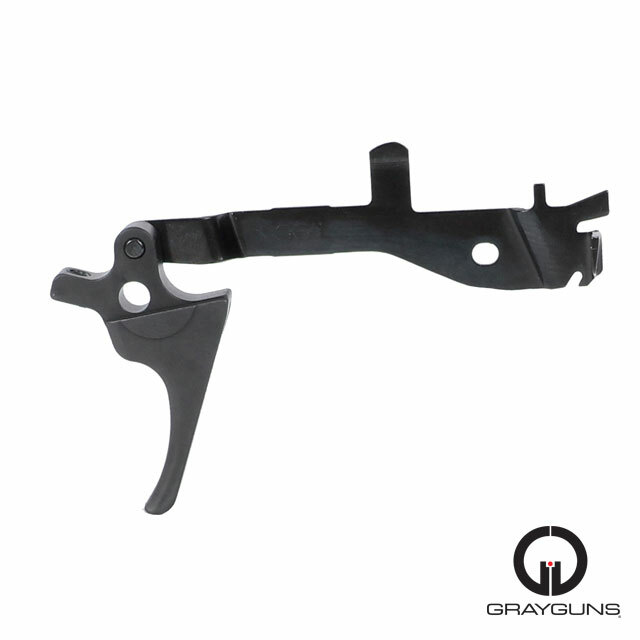 Each Grayguns enhanced-geometry trigger bar is micro polished for superior smoothness and perfectly timed function. Reduces the pull weight of double and single action without the need for spring replacements. Maintains all factory safety functions. The kit is 100 percent American made from precision machined heat treated tool steel. Parts are hand-finished and treated with tungsten diamond like coating (DLC) for unlimited service life. This kit is currently available in two versions. You’ll need to inspect the frame of your P226, P229 or P228 DA/SA pistol to determine which version to order. A research and development project is planned to fit older versions, and P220s are currently being worked on. This can only be purchased as a complete system and requires the trigger and trigger bar in order to function. 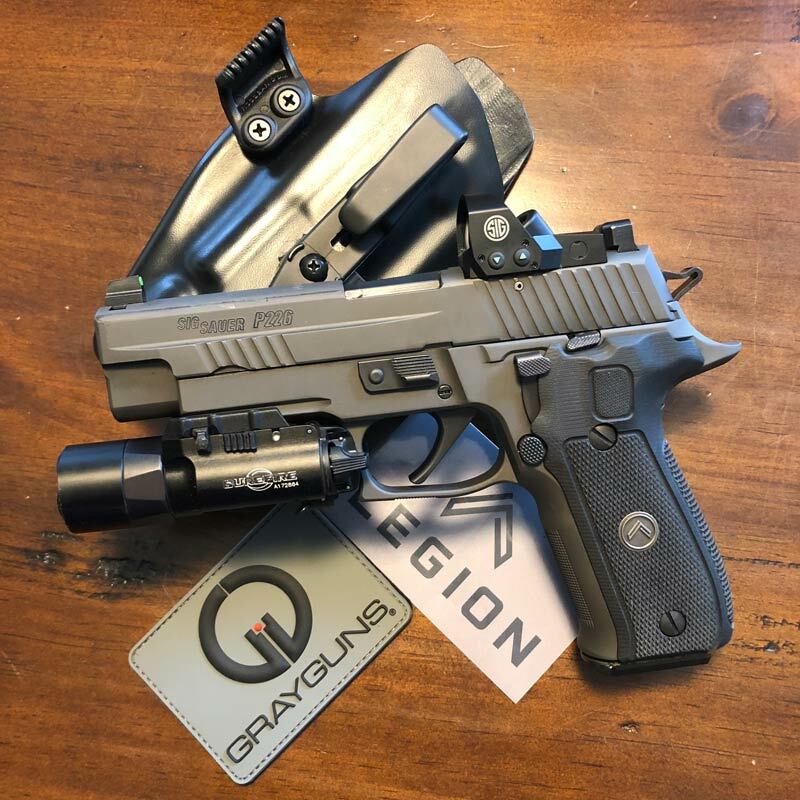 October 15, 2018 – I own a Sig Sauer P229 9mm Legion. I purchased it because of the SRT (Short-Reset Trigger) and Grayguns P-SAIT trigger. When shooting the P229 I was still not quite satisfied with the DA pull. When I saw GG announce the EDC Straight Optimized Trigger Kit I immediately asked GG if it could benefit the DA pull on my Legion. Of course they said it would positively enhance the trigger pull, So I decided to buy it. Installation was a breeze. The parts slipped right in. My immediate impression was a very smooth and very consistent DA pull. Much better than I had been used to. The SA pull was also very smooth. After shooting 100 rounds of Winchester 9mm NATO 124 gr FMJ ammo I was sold on this trigger kit. I purposely shot 50 rounds DA by dropping the hammer after each round shot. At 10 and 15 yards all of the rounds were kept within an 8 inch circle when shooting off-hand. I do feel the DA pull achieved after the installation of the EDC Straight Optimized Trigger Kit improved my ability to shoot the P229 smoothly in DA. I am pleased with my purchase. 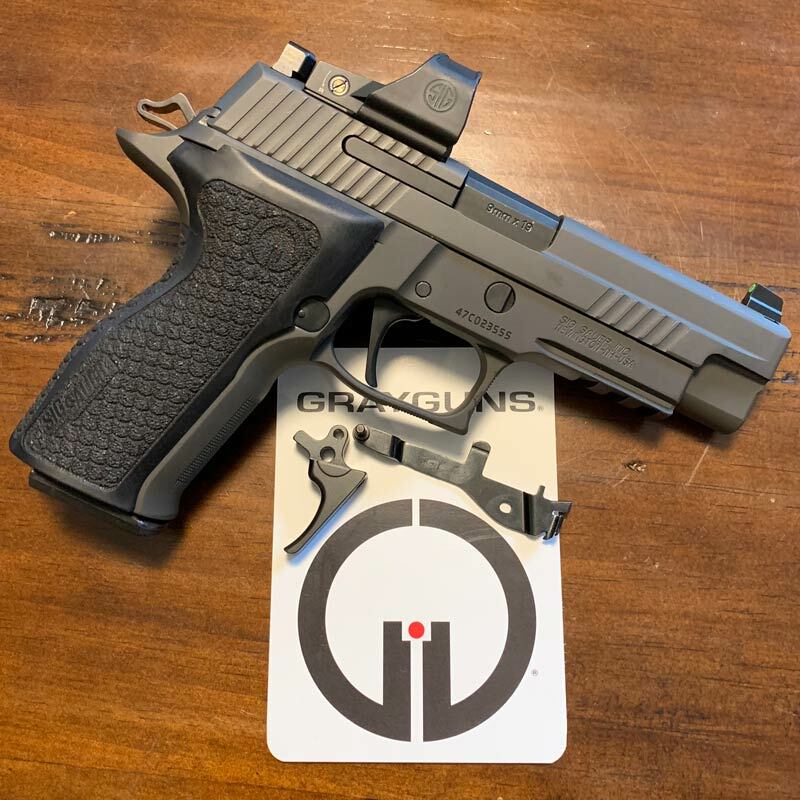 March 8, 2019 – This is an update to my October 15, 2018 review of the GG EDC Straight Optimized Trigger System for SIG P-Series. I am still quite pleased with the GG EDC SOT I installed in my P229 Legion with DAK Compatible frame. Trigger pull just keeps smoothing out. When I saw GG finally had the EDC SOT for the NON-DAK compatible frame I purchased one for my M11-A1 based on the experience I had with the EDC SOT I had installed in the P229 Legion. I had already installed a GG Dual Adjustable Flat Trigger in the M11-A1 which really helped the DA trigger pull but as with the P229 Legion I still wasn’t happy. The GG EDS SOT for the NON-DAK frame arrived in 3 days. It was also very easy to install. After disassembly of the pistol, which included slightly moving the pin that holds the SRT safety lever in place and then removing the safety lever, the new trigger bar with new trigger fit right in place. The SRT safety lever was re-inserted, and the pin pushed back into place. Tigger pin and spring was reinstalled to allow the dual adjustable trigger that came with the kit to be adjusted for pre and over-travel and then the pistol was completely reassembled. Before installation of the EDC SOT system the DA trigger pull with the GG Dual Adjustable Flat trigger was between 8.25 and 8.5 lbs using an 18# mainspring. After the EDC SOT system was installed, measured trigger pull never went above 8.0 lbs., staying between 7.5 and 8.0 lbs. I am extremely satisfied with the EDS SOT systems I installed in my P229 Legion and my M11-A1. Awesome product works as advertised. Installed in my P229 sas 2 and still cant believe the results. Dropped about two lbs from double action and somehow smoothed the creep from single action. Feel of the action is generally smoother and more consistent. Only slight drawback is an increased trigger reach. The increased reach was expected due to trigger being intermediate length as opposed to short trigger I replaced, but is minimal and cured the trigger slap and pinch. Not so patiently waiting for P220 variation and other products mentioned coming soon. I installed two DAK compatible ones in my p229 Legions and one in an older non-DAK compatible model p229. In all cases the trigger pull became lighter by at least a pound in DA and a few ounces in SA. Furthermore the pull became much smoother in all 3 guns. The slightly longer reach is not really noticeable with my medium size hands, so a very good improvement. Would love to see a version of this trigger system for p224 and p227 (though with just the GGI straight trigger my p227 DA pull is under 8#).